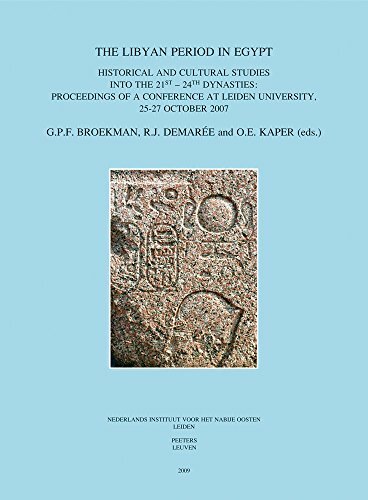 This volume contains the Proceedings of a conference held in October 2007 at Leiden University on the Libyan Period in Egypt. The study of the Third Intermediate Period, and most notably its chronology, has become stuck in controversies ever since publications by David Aston, Anthony Leahy, John Taylor and others raised doubts as to the chronology presented in Kitchen's seminal study The Third Intermediate Period in Egypt (1972). There was clearly need to discuss the controversial aspects of the chronology and culture of the period with all the parties involved. The timely nature of the conference was confirmed by the enthusiastic response from those colleagues who were invited to participate. In the end, a total of 24 speakers presented in front of an audience of some 120 scholars and students hailing from fifteen different countries. It was thought that the chronological issues surrounding Dynasties 21-24, the Libyan Period, should be the principal focus of discussion, because it is here that the largest uncertainties still remain. In addition, several scholars were invited to present recent archaeological finds from their own field work. Only by considering new material may we hope to solve the remaining problems, and new insights into the Libyan Period are likely to emerge from the combined study of a wide variety of sources. The topics of controversy lie mainly in the realm of chronology. Apart from this, several papers deal with the cultural developments of the period. An interesting joint theme that emerges from these is the appearance of archaism in the art of the second half of the Libyan Period. Several papers include comments on a newly found interest in the proportions and iconography from the classical periods of the past, notably of the Middle Kingdom.